Minsk said he has two candidates in mind. But he has a wide field to pick from — on the Democratic side at least — where the candidates are trying to out-green each other as they roll out their campaigns and tours. The major Democratic candidates for the presidential election are hoping to make climate change a decisive issue in the already crowded race, especially capitalizing on public anger over President Donald Trump’s inaction to address it. Trump has consistently dismissed climate change and wrongly cited recent winter snow storms to dispute the scientific consensus that carbon emissions are causing earth temperatures to rise. Democrats hope they can use climate change to distinguish themselves from Trump, whose administration has unwound several environmental protections, including measures to curb greenhouse gases, and has weakened regulations in order to boost domestic energy production from fossil fuels. Trump has also rejected his own administration’s findings and warnings that climate change could decimate the U.S. economy if quick action is not taken. “Not only is it an important issue in terms of the environment, health and economy, it’s a good way to show just how reckless a fact-free governing can be,” said Mo Elleithee, executive director at Georgetown University’s Institute of Politics and Public Service. Recent reports with more dire predictions are spurring greater urgency this presidential campaign, said one of the candidates, Sen. Cory Booker of New Jersey. “The more the science comes up, the more the urgency,” he said. This comes after years of presidential candidates dancing around the issue, careful not to lose centrist voters uncertain about the threat. Candidates’ calls for urgent action now appeal to young people like Minsk and throngs of youth activists who have participated in demonstrations to force the party to prioritize climate action. But analysts say Democrats face the difficult task of convincing middle class Americans that climate solutions are worth the priority and the price. Democratic Sens. Kirsten Gillibrand, of New York, Kamala Harris of California, Elizabeth Warren of Massachusetts and Vermont independent Bernie Sanders, who are also running for president, have similarly spoken loudly about climate change in the early weeks of their campaigns. 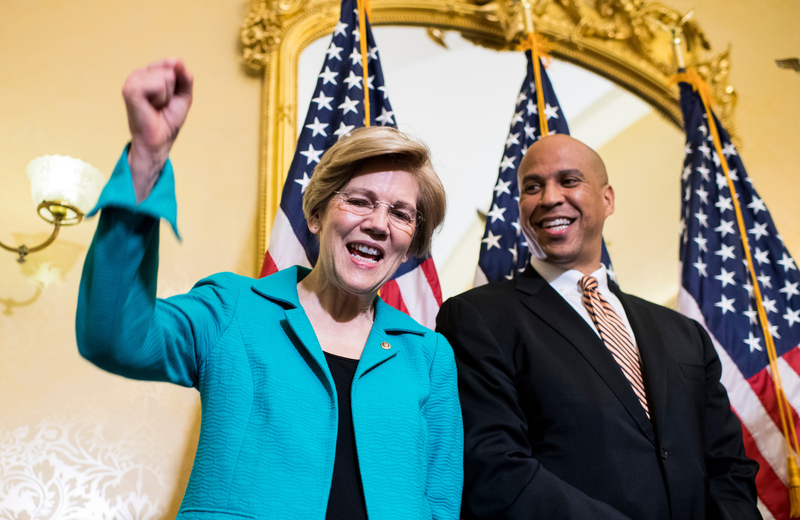 “For Democratic candidates, it is a necessary but not sufficient issue for victory,” said Christopher Borick, a professor of political science and director of Muhlenberg College’s Institute of Public Opinion. Polling shows increased interest in climate change, especially among likely Democratic voters. While most polls show the economy and health care remain the top priorities for most Americans, growing numbers consider acting on climate change important. Democrats are heading into the 2020 campaign against Trump as he benefits from a strong economy, which polls say resonates more with voters than climate change. Democrats’ challenge will be tying climate change to the economy as they try to persuade voters worried about the costs of solutions, analysts say. “In fact they’re making the case that by going all-in on green energy, you’re helping the economy,” said Borick of Muhlenberg College. Under pressure from young environmental activists, most of the Democratic candidates have endorsed the Green New Deal, a proposal made recently popular by Rep. Alexandria Ocasio-Cortez, the New York Democrat, who calls for addressing climate change and its consequences through a radical multisector overhaul of the U.S. economy. The legislation would not have the force of law, but the Green New Deal is so far the boldest policy, dovetailing climate change to all sectors of the economy. It calls for broad changes, including moving the country to 100 percent renewable energy, transforming the agriculture and financial sectors, and social and racial justice reforms. The boldest stance has come from Washington Gov. Jay Inslee, who on March 1 kicked off his presidential bid with a video montage talking about climate change over a long time span. Inslee, who has made global warming the top issue of his campaign, said it is the single most important threat facing the U.S. and combating it should be the country’s “first, foremost and paramount” duty. “Climate change is not more important than the economy; it is the economy … climate change is already impacting our economy, and fighting climate change will build our economy,” he said. A recent Pew Research Center report on the public’s priorities found that the share of people who say global climate change should be a priority for the president and Congress has jumped from 26 percent in 2011 to 44 percent. A separate Yale University and George Mason University study published Feb. 12 found that about 60 percent of people in the U.S. were “alarmed” or “concerned” about global warming in 2018, up from 43 percent in 2013. Still, the issue remains a higher priority for Democrats and independent voters than for Republicans. The surge of young, energized progressive activists who helped push the issue to the top of the Democratic Party agenda in the November 2018 elections, plan to keep up the pressure for the 2020 campaigns. “Young people are making it really clear to politicians that if they want to win the youth vote, acting on climate change in line with what scientists demand is not negotiable,” said Stephen O’Hanlon, a spokesman for Sunrise Movement, a youth-driven activist organization. The group has led throngs of young advocates in climate demonstrations across the country and on Capitol Hill, where they have protested at the offices of congressional leaders, demanding support for and action on the Green New Deal, including from House Speaker Nancy Pelosi. “We will be at rallies and town halls in early primary states starting this summer to demand all the candidates make the Green New Deal a day-one priority and ensure that their Green New Deal platforms call for a World War II-scale mobilization in line with what science demands,” O’Hanlon said. Recent floods, wildfires and other extreme weather events, he said, have made the need to act on climate change more urgent. Indeed, parts of the U.S. are still undergoing long recoveries from historic storms like Hurricanes Harvey and Maria that caused billions of dollars in damage in 2017, as well as raging wild fires in the west made worse by dry conditions and a more active than predicted 2018 hurricane season that included Florence and Michael, which caused significant destruction in the southeast. While individual extreme weather events can’t be blamed solely on global warming, scientists say rising earth temperatures exacerbate them. Rabe, of the University of Michigan, said candidates are reminding voters of those events and the more urgent calls for action made by scientists. According to the National Oceanic and Atmospheric Administration, 2018 was the world’s fourth warmest year on record as rising global temperatures linked to carbon emissions from human activity persist. The record setter: 2016. That year was the warmest in the agency’s 139 years of tracking temperatures, followed by 2015 and 2017. A report issued in October by the U.N. Intergovernmental Panel on Climate Change calls for “unprecedented” action to limit global warming to 1.5 degrees Celsius as the potentially catastrophic effects of climate change become more imminent. A government report issued in November echoed those calls and warned of the risks to sectors of the U.S. economy from agriculture to transportation. While the issue remains less important for most Republicans, Elleithee said a minority in the GOP care about climate change, and a potential Trump primary challenger who brings up climate change may weaken the president’s chances in some states. But Nick Loris, an economist focusing on energy and environmental issues at the conservative Heritage Foundation said that while climate change is important to Democratic candidates, it may not necessarily be a winning strategy in 2020. “It’s certainly not surprising … they’ve historically been climate champions in the past and feel like it’s important to their base,” Loris said. Bold climate proposals Democrats are pushing, including the Green New Deal, may be “appealing on the surface,” he said, but once voters understand their implication for jobs and electricity prices, the support will drop. To counter the Democrats’ message in 2020, Loris said, Republicans can be expected to highlight the costs associated with their bold ideas, while proposing free-market options to control climate change, including industry-led innovation and technology. “The message is going to be that what the left is pushing for are very costly, ineffective solutions, no matter where you are on the science,” Loris said. While young people have helped push climate change to the top of Democratic candidates’ conscience, Rabe said, their success in the general elections will depend on extending that political engagement and activism to the voting booths.